The Canon EOS Rebel T5i - also known as the EOS 700D - has become a hugely popular camera for Canon ever since its launch, and it's easy to see why. By shoehorning a number of advanced specs into a small, light body, and managing to deliver it at a low price, Canon has pulled together a winning formula. The camera packs an 18MP APS-C-sized sensor that also records Full HD video, and thanks to the powerful DIGIC 5 processing engine on board it can fire at a very respectable 5fps when shooting continuously. This is the same frame rate as some more advanced and pricier models, which makes it a great choice for capturing moving subjects with clarity. You also get a clear viewfinder, as well as an LCD screen that pulls away from the body and flips all the way around to face the front when you need it to. This also means you can take shots from ground level, or above head height, and still see exactly what you're doing. This screen is also completely sensitive to touch, much like a smartphone or tablet. Among other things, this lets you focus and take the images in a single action, by simply tapping the screen wherever you like. You also don't need to go anywhere near Photoshop, as a range of built-in Creative Filters let you apply instant effects such as Soft Focus, Grainy Black & White, Miniature Effect and Toy Camera. Best of all, you can make things as easy or as complex as you want in terms of control. Set the camera to its Creative Auto mode and it will do all the hard work for you, choosing the best settings to use for every scene you throw at it. Once you get more confident, you can switch to one of the other exposure options, which will let you control shutter speed and aperture for when you need to get extra creative. You also get access to thirty years' worth of lenses in Canon's EF and EF-S system, so you'll have no trouble finding the lens you need to take the images you want. From fisheye and wide-angle right through to macro and super telephoto, Canon has an option to suit your creative desires. And it doesn't stop there, as you can use lenses from the likes of Sigma and Tamron too! 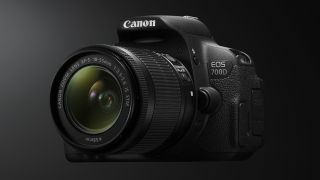 We've checked all the best prices on the Canon EOS Rebel T5i / EOS 700D so that you don't end up paying a penny more than you need to – scroll down to see today's best deals.